A computer glitch in a baggage handling system is causing havoc at New York City's Kennedy Airport. 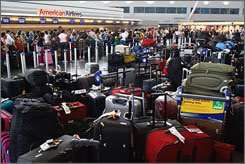 American Airlines says a software problem crippled the baggage conveyor belt Wednesday morning in its terminal at JFK. About 20 flights have been delayed by at least an hour while technicians try to resolve the problem. The airline is sorting bags by hand, but the backup has left the terminal brimming with hundreds of bags. Passengers were being given the option of flying without their bags. The airline is promising to deliver the delayed luggage once the issue is resolved. At the airport, huge lines were formed at the check-in kiosks and scores of bags are piled up. Meantime, the Transportation Security Administration, or TSA, is sorting bags manually.The airline is announcing the issue to passengers and those who don’t want to fly without their luggage can wait for another flight.American said that once the issue is resolved, the bags that are left behind will be sent on their way to the customer's destination and delivered to him or her.The residual airline delays across the country caused by the JFK baggage snafu is not yet clear. Wagner said many of the delayed flights are international.